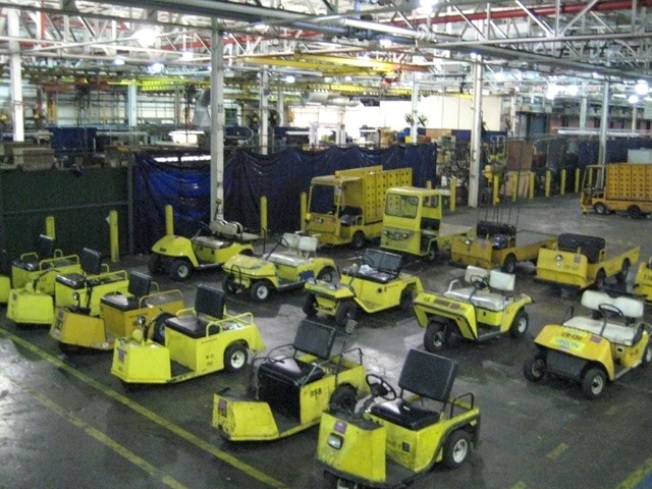 Want to see yourself cruising around in a factory cart? Start bidding. The U.S. economy turned in a surprisingly good performance in the fourth quarter, surging ahead by 5.7 percent on an annual basis, according to a government report released Friday. President Obama was quick to highlight the economy’s progress and “the swift and aggressive actions that made it possible." At a manufacturing company in Baltimore, Md., Obama noted that last years’ massive economic stimulus program had also "stopped the flood of job losses." He also repeated his administration’s commitment to spur job growth to re-hire the 8 million workers sidelined by the worst recession in 60 years. Most economists wouldn’t argue with those statements. With more $1 trillion in government, bank bailout investment and loan guarantees, on top of another $1 trillion-plus in pump-priming from the Federal Reserve, it would be surprising if that money didn’t register a strong showing as it moves through the economy and financial markets. Friday’s GDP numbers follow a positive showing in the third quarter, when GDP advanced 2.2 percent, along with other economic indicators showing signs of life in housing, industrial production and consumer spending. Consumer spending is beginning to come back from the depths of the recession — and confidence is slowly coming back. Corporate profits are also perking up. Of the 40 percent of companies in the Standard and Poor’s 500 that have reported earnings so far, roughly two-third have come in better than expected. Some small businesses are also reporting a pick up demand and have begun tentatively hiring back workers. But when you look a little more closely at the numbers, it quickly becomes apparent that it’s hardly time to start breaking out the champagne. A big part of the gain comes from a statistical adjustment for changes in inventory levels that doesn’t reflect real growth. Over the past year, businesses cut deeply into those inventories — not wanting to get stuck with unsold goods. Now that they’ve cut them to the bone, the rate of inventory-cutting has slowed. The way the GDP is calculated, that slowdown adds to “growth” — even though it doesn’t reflect increased production or sales. If you back out that inventory adjustment, GDP grew only 2.2 percent. Friday’s report was the preliminary reading on GDP, which will be revised twice before they’re final. Last time around, the number for the third quarter of 2009 started out at 3.5 percent before being bumped down to 2.2 percent for the final report. That could well happen this time around. Mike Englund at Action Economics thinks today’s number overestimated the drop in imports because the preliminary numbers may have overestimated the drop oil consumption. He says that accounted for a full percentage point of the 5.7 percent gain in the fourth quarter. Even if the preliminary number holds through two rounds of revisions, few economists see that kind of growth as sustainable. A panel of economists surveyed by msnbc.com said they see U.S. GDP moving ahead at 2.7 percent this year. Most of the credit for the boost in GDP has to go to the stimulus — along with the Fed’s historic moves to flood the system with cash and buy up mortgage bonds that no one else wants to touch. What’s far from clear is whether the rest of the economy’s gears will begin turning on their own — once the stimulus spending fades and the Fed turns off the money pump and begins soaking all that excess money. Reversing course — from “easy” money to a “tighter” monetary policy — is going to be extremely difficult to pull off. If the Fed drains money too quickly, it risks stalling the recovery. If it drains too slowly, and keeps interest rates low for too long, it risks creating another bubble — or an outbreak of inflation. The folks on the Fed are in a spirited debate about this quandary. This week’s decision by the Fed’s rate-setting committee included a dissenting view from Thomas Hoenig, president of the of the St Louis Fed, who thinks it’s time to start thinking about raising rates to fight inflation. The rest of the Fed disagrees. At the center of that debate is the question of just how much “slack” there is in the economy right now. The prevailing theory is that with so many people out of work, wages going nowhere and companies competing with each other for sales by keeping prices low, there’s just not much that of inflation right now. If that theory is wrong — if companies already have taken the slack out of their businesses — the recovery could put more pressure on inflation than is widely expected. There is also a risk that the “longer term” problem of large increases in the national debt is becomes a more immediate problem. If investors around the world begin worrying about the size of that debt, they may demand higher interest rates to lend Uncle Sam money. That would also be bad news for the economy. That’s why President Obama wants to freeze spending and set up a commission to look for ways to trim the debt. But cutting spending won’t be easy. Most of it goes to programs like Social Security, Medicare and defense that no one wants to see cut. Worse, the cost of Medicare is rising faster than the economy is growing, so it eats up a bigger piece of GDP every year. With that spending “off the table,” there’s only 12 cents of every tax dollar left for education, roads, the courts — all the things we expect government to provide. That’s the part that will get cut. There are also signs of a bottom in the housing market, but it’s too soon to say the worst is over. After bouncing along at what looked like a bottom, homes sales recently have headed lower again. As long as we continue to see more than 300,000 foreclosures a month — and those homes are dumped on a depressed market at discount prices — it’s hard to see how we get a sustainable recovery. The outlook on that front isn’t promising. Much of the early wave of foreclosures came from adjustable mortgages that had a two- or three-year “teaser” rate. Another nastier product, called a “pay-option ARM” has a longer “fuse.” These are expected to begin resetting in large numbers this year and next. Unless something can be done to defuse those resets — or refinance those loans — there will be even more foreclosures. So far, the government’s effort to stop foreclosures has fallen woefully short of the mark. Most estimates suggest that foreclosure haven’t peaked and could rise to 4 million this year. No matter what the latest GDP numbers show, most people judge their health of the economy based on their employment status. The cruel reality is that it takes the job market many months to recover after the economy begins a convincing upturn. That’s because employers do everything they can to meet increased demand – before they hire permanent workers. They need to be fully convinced the recovery is real. They also may add overtime hours for current workers, or hire temps to pick up the pace of production. So “growth” is really about getting being the eight million people sidelined by the recession back to work. That math on that score is also troubling. Even if we get back to “robust” growth that we saw in the mid-00s, the economy would only add about 300,000 jobs a month. You need about 125,000 just to keep up with growth in the workforce. So if we got job growth back on track tomorrow — with, say, 175,000 net new jobs a month — it would still take nearly four years to get those eight million people back to work. Even when hiring begins again, the other important trend to watch is the growth of wages. With so many unemployed people out there, employers don’t have to raise wages to attract workers. A separate report Friday showed that wages rose more slowly in 2009 that at any time one record.